INDIA has offered USD 100 million credit to Bolivia after President Ram Nath Kovind held productive and extensive talks with his Bolivian counterpart Evo Morales here. Kovind is on a three-day visit to Bolivia, the first high-level visit from India to the Latin American country since the establishment of diplomatic ties. President Kovind held wide-ranging talks with his Bolivian counterpart Morales on a number of bilateral issues such as economy, space and IT. The two leaders also reaffirmed their commitment to strengthen political and economic engagement. “India offered 100 million US Dollar Line of Credit to Bolivia for financing development projects,” according to an official statement. Both countries also agreed on the need for reform of the UN Security Council to make it reflective of contemporary realities, the statement said. The two sides also signed eight MoUs in various fields, including academics, space and medicine. 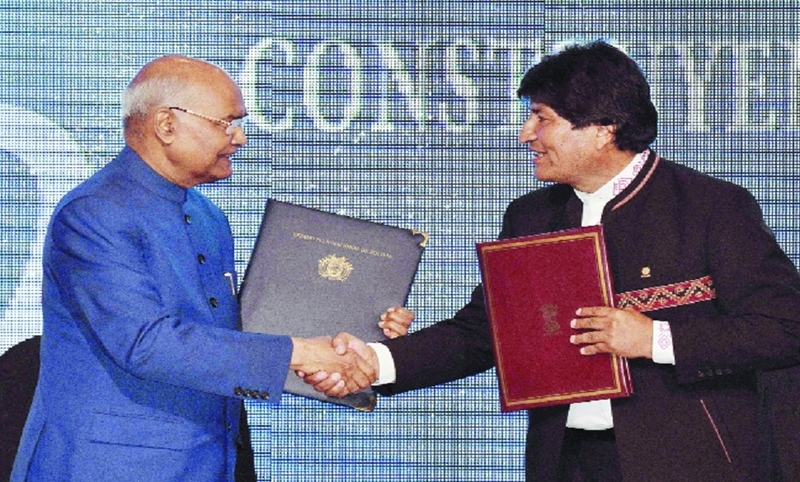 “We are happy to have Bolivia as a partner in the International Solar Alliance and welcome the signing of the framework agreement establishing the bond,” Kovind said in a statement. In addition, the two countries signed MoUs in the fields of culture, visa waiver arrangement for diplomats, the exchange between diplomatic academies, mining, traditional medicine, establishment of centre of excellence in IT and bi-oceanic railway project, according to an official statement. “The two countries agreed to further expand business ties in pharmaceuticals and health care; automobiles and engineering; machinery and textile; and metals and minerals,” it said. President Kovind also addressed the India-Bolivia Business Forum on Friday and said that the two countries have their own economic strengths and they can complement each other in the mutual quest for growth and prosperity. “Our joint participation speaks of our deep mutual commitment to strengthening business ties. The task ahead for us is clearly cut out. Our political ties are strong and growing, but we have to work a lot more, hand-in-hand to bring our economic partnership to the level of our mutual understanding,” he said. The event was partnered by Bolivian Chamber and Industry groups and the Federation of Indian Chamber of Commerce and Industry and the Confederation of Indian Industry. The Indian president is accompanied by top executives of 30 Indian companies representing different sectors, including gold, mining, infrastructure, IT, automobile and energy. Mahatma Gandhi anticipated some of the ‘pressing challenges’ of the 21st century: Kovind: THE world today is very different from the one that Mahatma Gandhi lived and worked in, but he anticipated some of the “pressing challenges” of the 21st century, President Ram Nath Kovind has said. Commemorating the 150th birth anniversary of Mahatma Gandhi in Bolivia on Friday, Kovind, who is on a three-day visit to the Latin American country, stressed on the relevance the Father of the Nation holds in the 21st century, saying his principles have shaped India’s developmental experience. President Kovind’s visit is the first high-level visit to the Latin American country since the establishment of diplomatic ties. The two countries have reaffirmed their commitment to strengthen political and economic engagement.